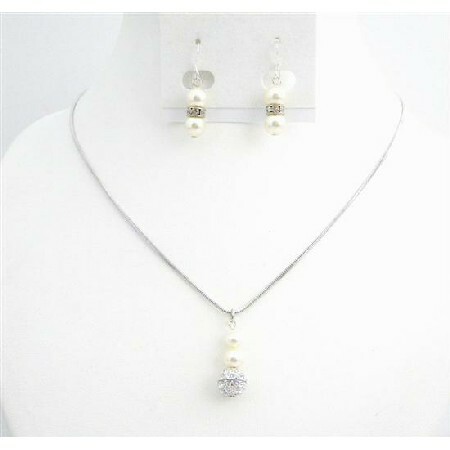 Ivory Pearls & Cubic Zircon Ball fully embedded sparkle like Diamond Pendant & Ivory Pearls with simulated diamond spacer earrings beautiful elegant Jewelry Set Swarovski Ivory Pearls. Affordable Bridal Bridesmaid Wedding Jewelry this is Special Color for Brides or Bridesmaid. Custom Handcrafted Jewelry Necklace Set. Each piece of jewelry is timeless & made with the finest Swarovski Pearls quality genuine Pearls & beautiful Swarovski.